This latest version of SophiaCompress(BREW) is capable of compressing BREW [*2] apps for big endian[*3] environment , such as apps for BREW phones "Nokia 3205". May 10, 2006, Sophia Cradle Incorporated has released SophiaCompress(BREW) 2.1. SophiaCompress(BREW)2.1 is capable of compressing BREW apps for big endian environment , such as apps for BREW phone "Nokia 3205". Also, SophiaCompress(BREW)2.1 is equipped with installshield wizard, helping users to install and setup the software easily. Nokia's BREW phones, "Nokia 3205" used in North America and Latin America is equipped with chipset other than Qualcomm's. As a result, "Nokia 3205" reads byte codes in big endian order. So BREW apps should also be compressed in a big endian environment. SophiaCompress(BREW)2.1 solved this problem by adopting its boot loader [*4] to big endian environment. Adopted boot loader for big endian environment. 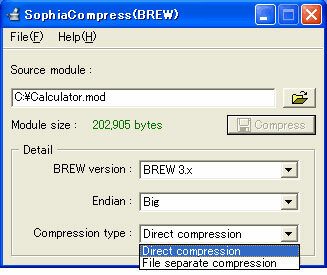 * BREW apps for Nokia 3205, compressed by SophiaCompress(BREW) 2.1 are already distributed in Latin America. Free Trial is available at the Sophia Cradle web site from May 12. For special discount offer, please see SophiaCompress(BREW) Overview. SophiaCompress(BREW) the only compression utility for BREW applications in the world. SophiaCompress(BREW) helps developers create smaller applications with better functionality and is used by many leading game makers, content providers, system integrators, etc. English version of SophiaCompress(BREW) is available. Endian is the order for storing byte codes in computer memory. In big endian order, high order bytes is stored first, while in the little endian order, low bytes are stored first. The word "endian" comes from the first chapter "A voyage to Lilliput" from "Gulliver's Travels" written by Jonathan Swift. In Lilliput, people who eat eggs from the small side are called "Little endians" and those who eat from the bigger side are called "Big endians".